While Cave Boy has many things, the thing he wants most is a pet. He searches near and far for a companion. However, his family members find something wrong with all the pets he brings home. Woolly mammoth is much too large for the family’s cave, and saber-toothed tiger causes papa to sneeze. Cave Boy’s wish finally comes true when his animal friends rescue him during a stampede. 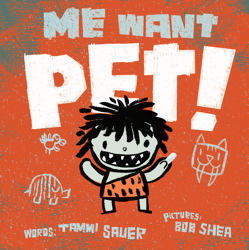 Kids will enjoy repeating the funny language used in the story and will be able to relate to Cave Boy’s desire to have a pet. However, most children will not be as lucky as Cave Boy and end up having three! This month, Kelly shares the fascinating photo-essay What the World Eats by Peter Menzel and Faith D’Aluisio. It took me approximately 30 seconds to compose and type this sentence. In that time a human eye would have blinked 210 times, a deadly black mamba could have slithered 720 feet (ugh…), the moon traveled 19 miles orbiting the earth and a skydiver could fall one mile. Pretty amazing. Author Steve Jenkins, has long been a favorite of mine. He has an with awe-inspiring ability to turn ordinary facts into extraordinarily amazing statements. For those who have not yet made his acquaintance, some of his titles include Bones: Skeletons and how they operate, Never Smile at a Monkey and 17 other important things to remember, Actual Size and Brothers and Sisters: Sibling relationships in the animals world. Each book manages to pack encyclopedic knowledge of its subject into a 32 page mostly picture and caption format. Generally working in double page spreads, Mr. Jenkins crams his books with sometimes startling, sometimes mind-boggling factoids. Much more than trivia, both curious kids and adults will not fail to be instructed and astonished by his information passed on in an informal manner. For instance, in one minute, a chilly crocodile’s heart may slow to just one beat while at the same time 59,000 barrels of oil are used world-wide. In one day, 50 new species of plants and animals are indentified as another 150 species go extinct (and bamboo grows 36 inches, which you may already know if you’ve ever planted bamboo.) In short, in the time it’s taken you to read this review, a giant tortoise has struggled to move about 30 feet and people around the world have drunk an equivalent of almost 5 million twelve-ounce soft drinks. Time’s a-wasting. Stop reading this and get yourself a copy of Just a Second. Katie is having a gray day. So, inspired by a painting filled with colorful birds, she attempts to brighten up – first, she puts on her green hat, then her yellow tights, her blue shoes…and ultimately she paints her entire self in brightly colored patterns! This creates some fizzy magic which transforms Katie into a colorful bird herself, and allows her to enter the painting and spend the day hanging out with the birds before returning home for her bath. This sweet, whimsical story is a celebration of the imagination and its transformative power. The text is minimal, the real star being the fanciful illustrations which transform right along with Katie, starting out soft and gray and small before expanding and exploding with color. 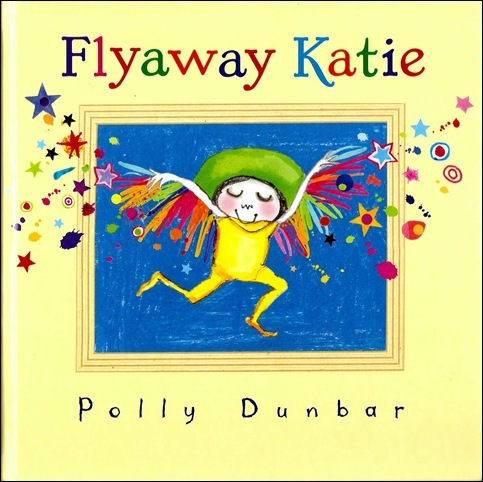 Flyaway Katie, published in 2000, was the debut picture book by author and illustrator Polly Dunbar, and is one of my favorites. Recommended for ages 2 and up. James answers yes to every question and his father creates humorous tales as to why his son should consider eating those foods. When James declares that milk is repulsive and that he won’t drink it, his father replies “good idea, milk gives growing children strong, hard bones so just think of all the great things you could do with nice soft bones.” Dad gives examples of how soft bones can be a plus, as well as how they will prevent James from doing some of the things he loves. James drinks his milk. 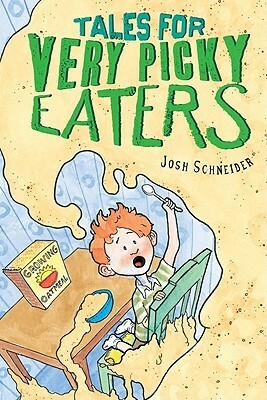 Each short chapter is accompanied by humorous illustrations that demonstrate Dad’s use of psychology while he cleverly guides his son away from his picky eating ways. By the last chapter James tries to give his father a dose of his own psychology, but Dad is one step ahead. I smiled throughout this book as I was reminded of my days with a picky eater. 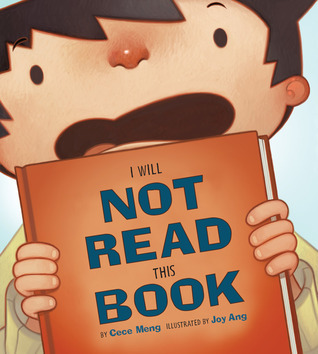 This year, there seem to be so many wonderful picture books about libraries and reading that I decided to review another one this month. This book is particularly appealing because the main character is resisting reading, rather than the usual loving books and reading. I think this will strike a chord with lots of parents, teachers, and kids too. Initially it seems that the little boy in the story just doesn’t want to do what grown-ups want him to do, but we quickly find out that “Reading is hard and I don’t read fast and sometimes there are words I don’t know. . . .” So now we know why he won’t read this book, and “YOU CAN’T MAKE ME!”. He won’t read this book even if you hang him upside down by one toe … over a cliff while tickling his feet … in a rainstorm with lightning above and sharks down below … and a dragon comes along and blows smoke in his eyeballs … and there’s a speeding train coming toward him … and he sneezes and you drop him. WAIT – if you drop him, he just might change his mind and read. This is a lighthearted look at those young ones who resist reading and their grown-ups who keep trying. — Just right! Madeline is in fifth grade and she lives with her parents on the island of Hornby in Canada. Her parents support the family by making sand-dollar art. Madeline is really the adult in the house. She takes care of everything–including her parents–and works as a waitress to make ends meet. When her parents are kidnapped by foxes, Madeline starts out to discover where they are and rescue them but her detective Uncle falls into a coma (something he has been looking forward to) and Madeline doesn’t know where to turn. 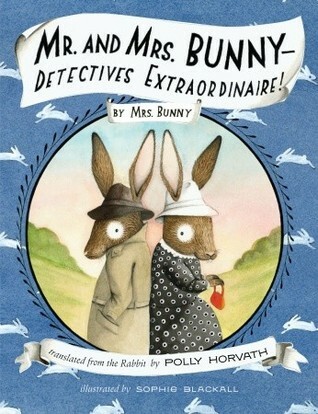 Then she meets Mr. and Mrs. Rabbit who have decided that their newest passion is to be detectives and they take her case pro bono (that means for free). This is one laugh after another. The story abounds with funny characters and silly situations. It also has many black and white fun illustrations. (I loved the illustration of Mr. Bunny’s disco shoes and also The Marmot in disguise) I loved Mr. and Mrs. Bunny who are enthralled with Madeline so much so that they build her her own bunny hutch beside their house and hope that she will leave her silly parents and come live with them. They are an adorable couple. They love one another very much but they argue a lot and they make sure that they get even when the other does something mean. I liked that about them. So visit a world where animals have cars, social clubs, email and Italian restaurants and speak several languages. Mr. and Mrs. Rabbit have warm generous heart, too. Recommended for Grades 3-6.